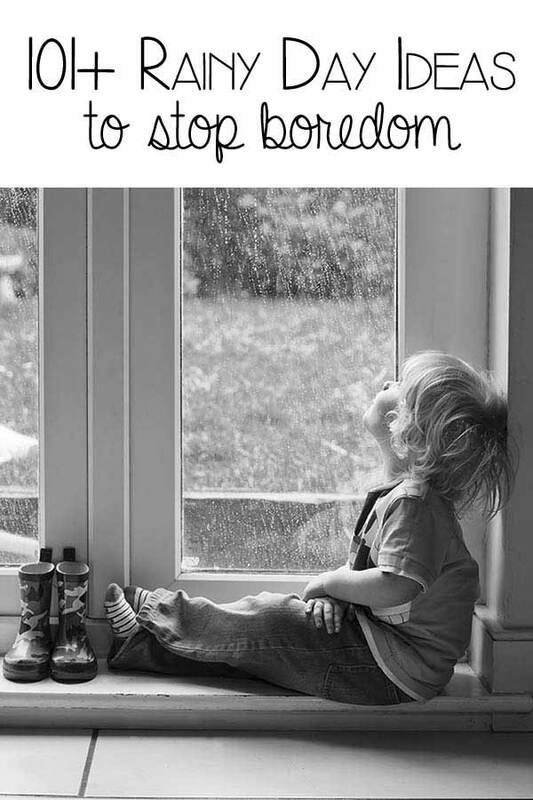 Remember rainy days when you were a kid? We always used to play sledging down the stairs in our sleeping bags. Until disaster struck and we crashed into a pile of laundry or some such. And mum got just a teensy weensy bit cross. And did her – very fine – impression of a sabre toothed tiger! … and now it’s the holidays. And it’s raining. And I’m the sabre toothed tiger. GRRRRR! Killing each other before breakfast? Driving us to an early grave in a bottle of gin? 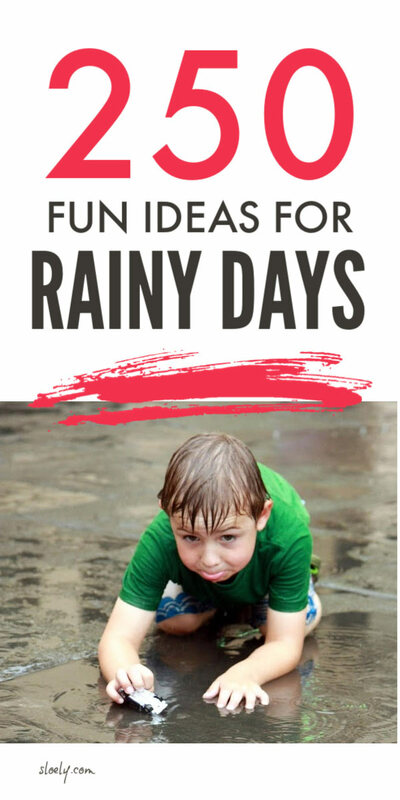 Well, there’s a whole bunch of rainy ideas here that work for us. They don’t – I’m afraid – come with a cast iron guarantee your family will never face complete meltdown on a rainy day ever again. But they do help – quite a bit – with the yelling. What’s a bit of rain anyway? 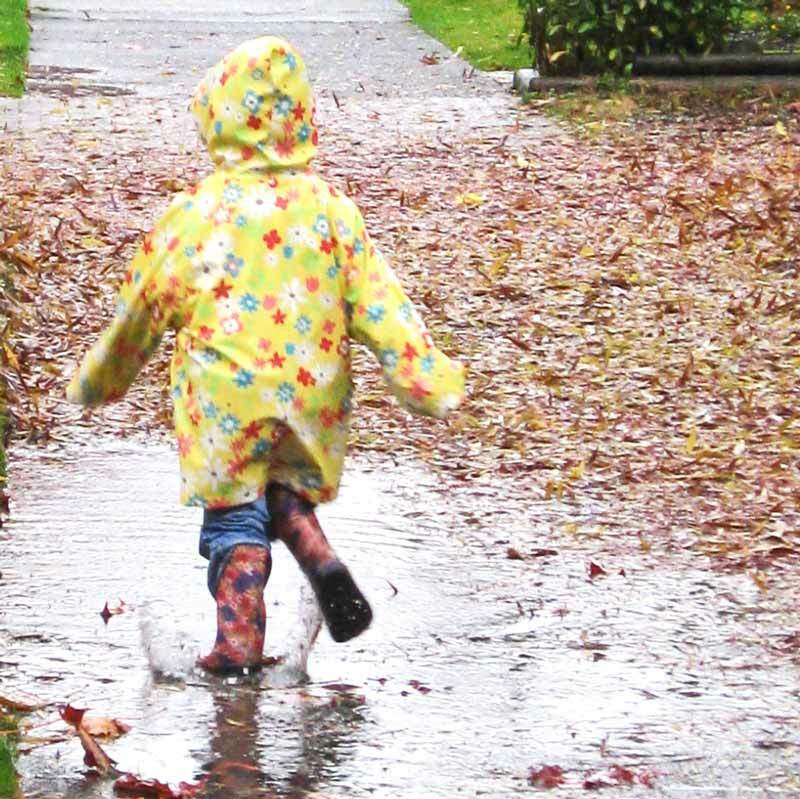 Just shove on your wellies and anoraks and have some fun outdoors. Even if it’s only an hour. You all run some energy off. And it’s an excuse to have a bath in the middle of the day when you get back. Which’ll take up at least another hour. 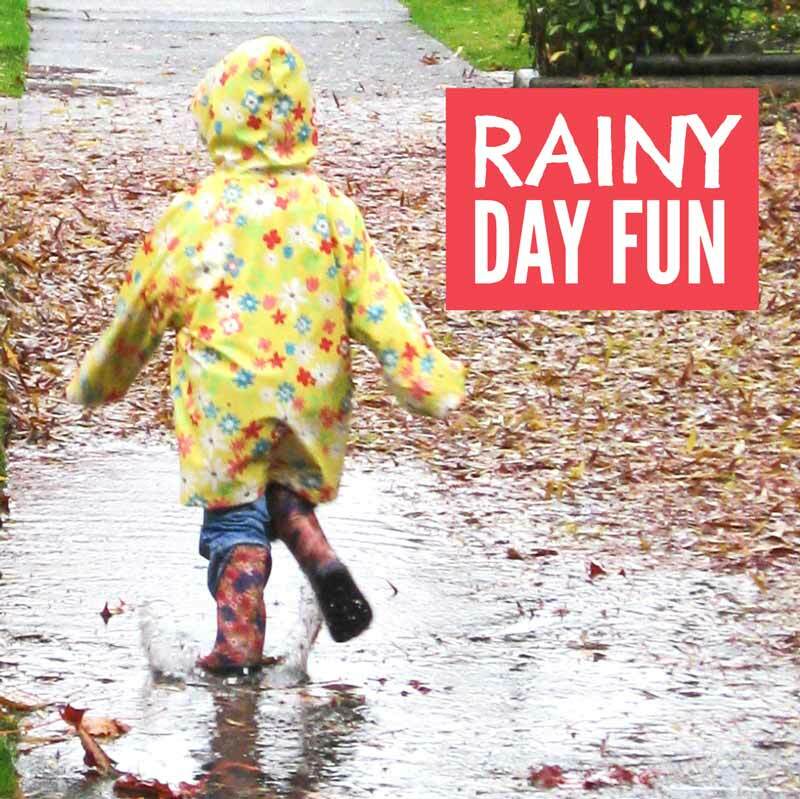 PLUS a rainy day is the best time in the holidays to hit the playground. You get everything to yourself. No waiting. No shoving. And if mummy’s feeling particularly stupid brave she’ll let you go on the button slide and drag through the mud! It’s worth serious brownie points the rest of the day. I promise. But if it really is too wet – there’s thunder, lightning that kind of stuff – this second tip is my fave. As early as you possibly can, switch off your phone, your laptop, the radio, the lot. And cuddle them. Listen to them. Read to them. Play any game they want. Basically give them undivided attention for that hour. Now of course they’ll come back for top-up attention, but it’s the best way I know to get them to entertain themselves. Seconded only by tip number three. Most of the time, I’m not massively into fiddly kids craft activities. – plus some strong tape, felt tips and scissors – they can do what they want with. Space rockets. Boats. Trains. Dolly hospitals. Castles. Smugglers’ caves. WW2 Bomb Shelters! It’s phsyical. It’s creative. It’s their thing. And keeps them going for hours on end. But in case World War Three does break out in your living room, I’ve found it helps massively to have a bunch of very energetic, but very simple activities up your sleeve. And when I say simple, I really mean simple. Twister – if you haven’t got Twister(USA), get it! It’s worth every penny on a rainy day! 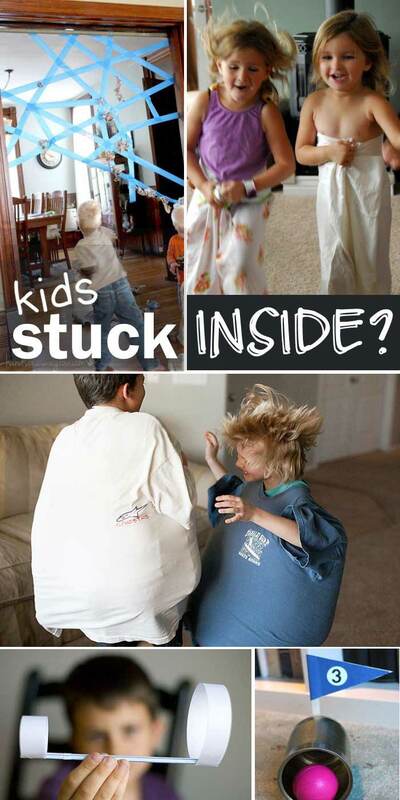 Classic Party Games – all those party games we played as kids are perfect for a rainy day. In case you’ve forgotten, I’ve got a massive list here of classic party games. If your kids are seriously high energy, it is worth coming up with a bunch of slightly more structured physical challenges to keep them going all day. Even the most physical kids have big sensory needs as well. And simple baking to help make tea is a great way to meet them. Now, I know some of you will be screeching “Not on your Nelly, Mrs!” at this point. And the very mention of baking sends shivers down your spine. Pastry and pizza are the easiest things ever for kids to do. Easier than cakes! Any kid – any parent! – can rub butter into flour with their fingers and add a bit of water to make a ball of pastry to roll out and cut into shapes for jam tarts or mini quiches or some such. And pizza dough is even easier. It’s just a bit of water and oil stirred into flour, yeast and sugar to make a big blob of dough you punch around a bit before letting it rise. When it’s risen, you knock it down and roll it out. And chuck toppings on. And the fab thing for kids is they can do it without help. And can come and go. They can make pastry. Leave it in the fridge. Play something else. Then come back and roll and cut it. I am totally NOT a good cook but we do this lots on rainy days. And I always find kids love it. It’s sensory. It’s fun. And I guess it’s just that old Montessori idea of them really enjoying simple responsibilities. For similar reasons, I’m a big fan of getting kids to make their own playdough. Now obviously you can buy it or make it for them. But they get so much more out of making it themselves. And then playing with what they’ve made. And … tick, tock, tick, tock … it keeps them entertained for a lot more hours on a rainy day! But you DO NOT need a fancy recipe to have fun making playdough. Keep it old school and give your kids a big bowl each, a bag of flour and a jug of water – food colouring if you must and can handle the carnage – and then let them experiment. Sometimes it will turn out crumbly. Sometimes sloppy. Just hold some flour back so they can thicken it up if they want. And for a bit of variety offer oil. Or dish washing liquid. Or glitter. To change the texture. It is a messy rainy idea, I admit. Me and my friend from down the road sit there rolling it for ages, over a cup of tea – long after the kids have disappeared somewhere or other – as we put the world to rights. The other simplest idea for sensory play on a rainy day is obviously painting. There are times, I just can’t be doing with the mess. Now as I confessed I’m NOT that crafty. I have my moments. But mostly not so much. 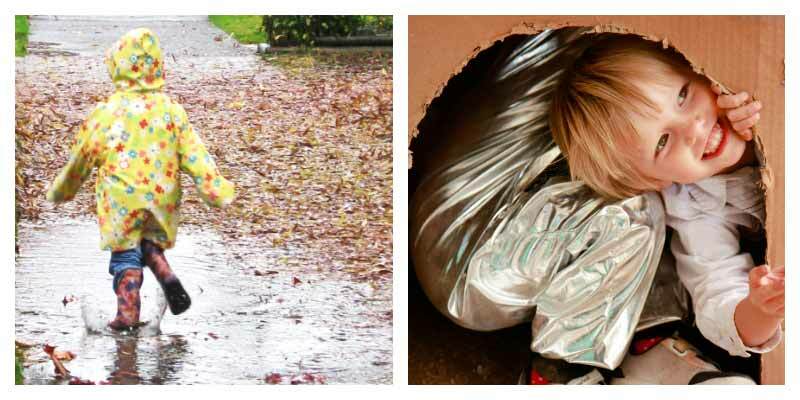 So if you do want some ideas for rainy day crafts head over to the fab – and appropriately named! 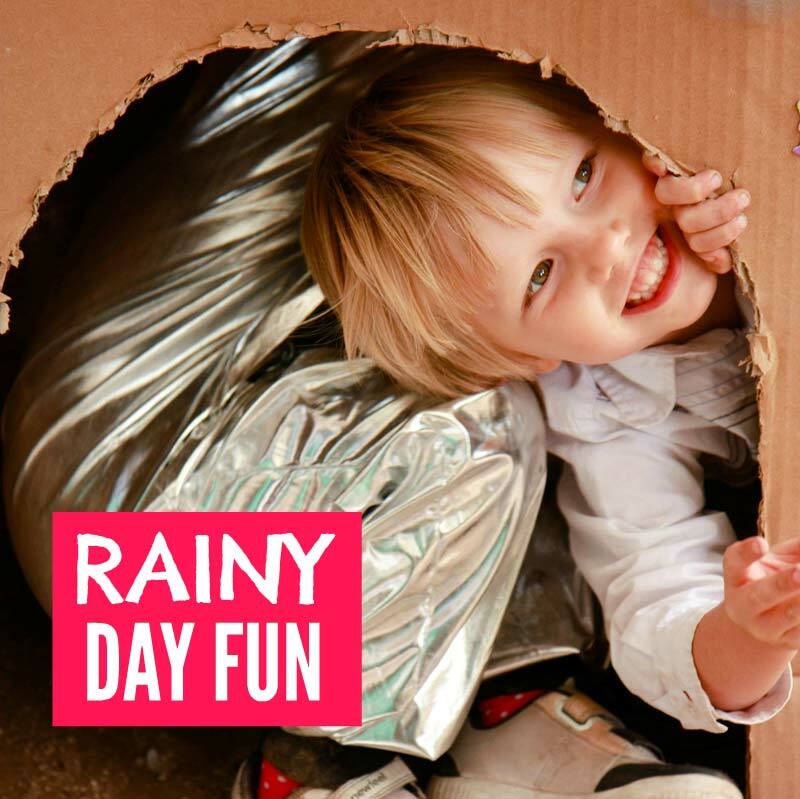 – Rainy Day Mum blog where Cerys the mum who writes it, has loads and loads and loads of rainy day ideas …. 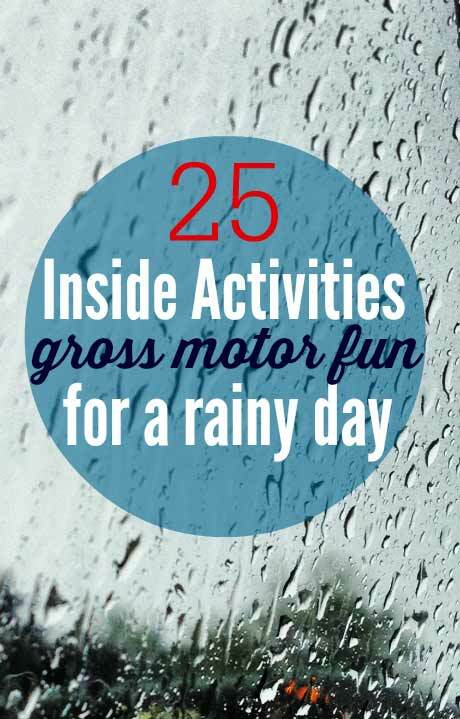 So there you go loads of rainy day ideas that will keep the kids entertained. AND you off the gin. Whatever the weather’s doing outside. I do hope these ideas help.